One way we like to think of Math Munch is as a window looking out onto a mathematical landscape. Now there’s a way for you to have that window on the wall of your classroom! Here’s the file for a classroom poster we designed. 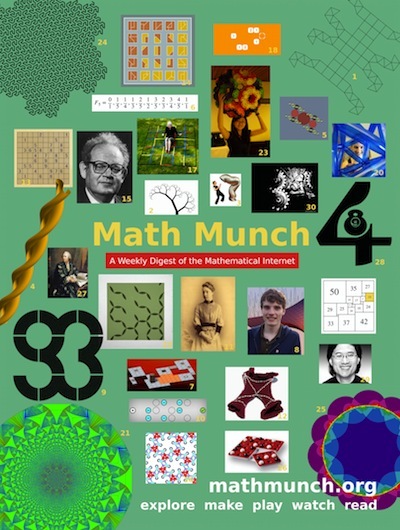 It contains thirty images that we’ve featured on Math Munch—people and objects, artwork and games. Having this in your classroom can be a daily reminder to your students of how big the math world is and an encouragement to your students to check some of it out on Math Munch. It’s an easy way to invite your students to explore Math Munch without necessarily building it into your instructional time. And here’s the crossword puzzle that goes along with the poster! Each image in the poster is a clue to the crossword puzzle. You might also find useful these flyers that got passed around during our share campaign. The classroom poster is designed to be printed in the dimensions 18″ x 24″. You have several printing options. You can print the poster yourself if you have access to a printer that can print that large. You can also take the file to your local print shop and they can print it for you. As an example, it’ll cost about $20 to have the poster printed at your local FedEx. Another option is to order a print of a poster through an online printing service. We haven’t found one that does a great job yet–so if you find one, let us know! Hang the poster and the crossword puzzle on your classroom wall where your students can collaborate on it over the course of the year. Give a copy of the crossword puzzle to each of your students for them to figure out independently. And once you have your poster hanging up in your classroom, please let us know about it! Snap a photo and share it by email or Twitter! We’d love to see our handiwork in action.